Small colourful sparkling details to brighten up your look on every occasion: the Earrings earring collection consists of delicate, discrete jewellery to add that final touch to your everyday outfit. All earrings are crafted with hard or semiprecious gemstones placed in a stainless steel setting and finished in gold, rose gold or silver. The Earrings Collection takes its inspiration from the most classic earring shapes women everywhere love, and it incorporates the latest fashion changes introduced each year: oval, round and the most romantic shape, the heart. The Earrings Collection contains every shade of hard and semiprecious gemstone, from the classic Zirconia sparkler to Black Agate. Oval-shaped earrings are available in white, blue, light blue, pink, and purple Cubic Zirconia, while the heart-shaped earrings come in pink, red, light blue and white in either a decorative silver setting or in a plain gold setting. Oval earrings are also available in a decorative rose gold setting with several unique semiprecious gemstones: the bright green Peridot, the opaque white Opal, the delicate pink Opaline, the deep purple Amethyst, as well as stones with very unique colouring such as Banded Agate, Apricot Chalcedony and Milky Aquamarine. 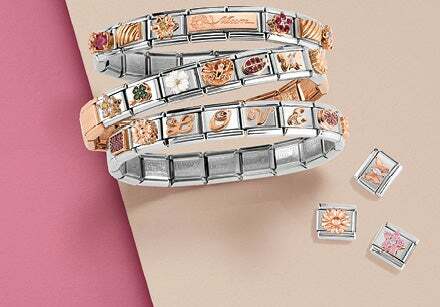 All are available in a rose gold oval setting. Round earrings are adorned with more classic hard stones: Black Agate, Turquoise, red and pink Coral, and Pearls. There are tons of different shades of earrings with coloured gemstones which you can also find in our matching bracelets to complete your look! The gemstones in the Earrings Collection can be paired with the stones decorating the Composable bracelets, so you can create your own personalised matching set to rock your look each day. Coloured Cubic Zirconia hearts are also part of the charms you can use to customise your Composable bracelets, just as you can also do with the oval and round-shaped gemstones. Mix and match the different gemstones to create a Composable bracelet to wear with your gemstone earrings , from the Earrings Collection and enhance your outfits with beautiful coloured semiprecious gemstone details. The matching sets you create with Earrings and Composable bracelets are accessories which complete even the most simple and casual outfits, adding a chic touch to each day.